Midterms give voters a final chance to hold the president accountable — and the stakes are huge for Democrats and Republicans. This edition of Newsmax magazine is not to be missed. Newsmax magazine brings you exclusive stories the mainstream networks won't report. Even the major media can't ignore Newsmax magazine — which has been cited on Meet the Press, CNN, Fox News, Rush Limbaugh, MSNBC, and many other outlets. Each month in Newsmax magazine you'll read hard-hitting investigative reports and special commentaries from George Will, Michael Reagan, Ben Stein, Dr. Laura Schlessinger, David Limbaugh, Christopher Ruddy, and many others. Dr. Ben Carson, best-selling author and commentator, tells America: "Each month I look for Newsmax magazine to give me the news I can't get elsewhere, you should too." Ben Stein adds that Newsmax reveals the "unafraid, uncomplicated, bare-knuckles truth about today's dangerous world." Mike Reagan, the elder son of the late President Ronald Reagan says: "I guarantee that you'll love Newsmax magazine." Special Bonus: Get this edition PLUS you will receive a 3-month trial subscription to Newsmax magazine — a value of $15 — at no additional cost or obligation. IMPORTANT NOTE: Sales tax included where applicable. Your trial subscription comes with convenient automatic renewal. At the end of your subscription, we'll notify you. 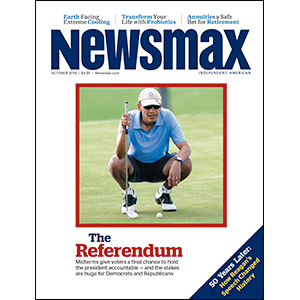 If you want to keep the publication, do nothing and we'll renew your subscription using your credit/debit card on file and charge you $39.95 ($34.95 for digital) for one year (12 issues) of Newsmax magazine and thereafter at the lowest renewal rate then in effect. There is no risk, you can cancel within the first six months for a full refund of the unused portion of your subscription. 'The Referendum' Newsmax Magazine October 2014 Midterms give voters a final chance to hold the president accountable — and the stakes are huge for Democrats and Republicans.